20.5" long, longest bead side 1", tallest bead .5"
2015. Assembled clay elements, underglaze, glaze, overglaze. Multi-fired. 4" x 13" x 8"
5" x 12.5" x 5.5"
2008. Assembled, slip cast clay elements, underglaze, glaze, overglazes. Multi-fired. 4.25" x 17" x 9.5"
2006. Assembled clay elements, underglaze, glaze, overglaze. Multi-fired. Covered: 4.25" x 9.75" x 6"
Uncovered: 3.25" x 14.5" x 6"
7.5" x 3.75" x 9"
2008. Assembled clay elements, underglaze, glaze, overglaze. Multi-fired. 4.25" x 9" x 9.25"
2008. Assembled slip cast elements: clay, underglaze, glaze, overglaze enamels. Multi-fired. 4" x 9" x 8.25"
30" x 1.25" x .5"
23.5" x 1.125" x .5"
I make poems for the eye and the hand. Composite moveable arrangements of forms support fired layers of color. Most of my sculptures have remained intimate in scale, and nod to the tactile and visual potential of clay surfaces. The current forms display new geometries that stem from organic shapes of previous work. Added color further differentiates real and implied space. Surface patterns, visual trails left by repetitive hand motions, lead the eye over shadows and enveloped spaces. I use ceramics, an integration of form and surface, to pose questions about placement, movement and perception. I have been interested in making installations/arrangements since the early 1970’s. Making my current sculptures involves experience, curiosity, and chance. So much of ones time is spent in the studio: ideas and process should be engaging. I try to imagine how forms, colors and patterns might read. It is intriguing how complex, juxtaposing characteristics of repeated lines plus hue and value can be when working with multiple parts and views. Most sculptures are fired 10-15 times. Everything is subject to change until the last firing after which the piece is on it’s own. For each bead a prototype was made in plaster and clay using carving and additive techniques. Found parts were imbedded into some of the prototypes. Readied prototypes were encased in plaster section by section, to make multipart molds. For each necklace I increased my library of forms. Mold making is a laborious process but casting techniques afford a particular desired look and enable replication. 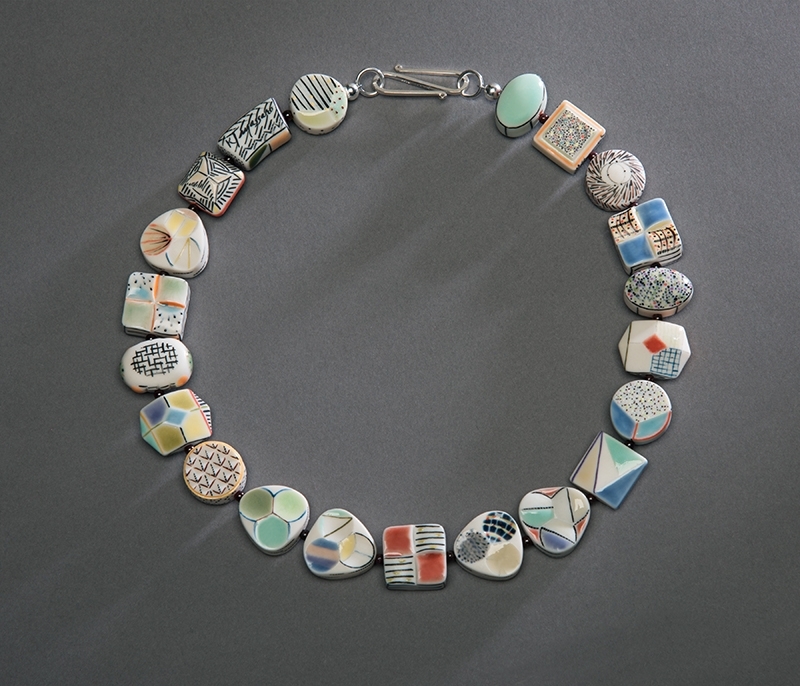 The clay for these necklaces is a beautiful porcelain casting slip. You’ll notice that the clay may be white, off white or greenish. Each cast and cleaned bead was sanded before and after it’s first “bisque” firing. A large palette of colored glazes rules my worktables. As you might expect, the process of brushing each bead with multiple glazes was most time consuming. Next, a glaze firing heated the beads to the “maturing” temperature when glazes melt into the dense rich porcelain clay surface. Some beads are refired to add more detail. The two holes for stringing are glazed to insure a durable hard surface against the 40lb test wire used to string the hollow beads together. Each pair of porcelain beads is separated by a small stone spacer bead. 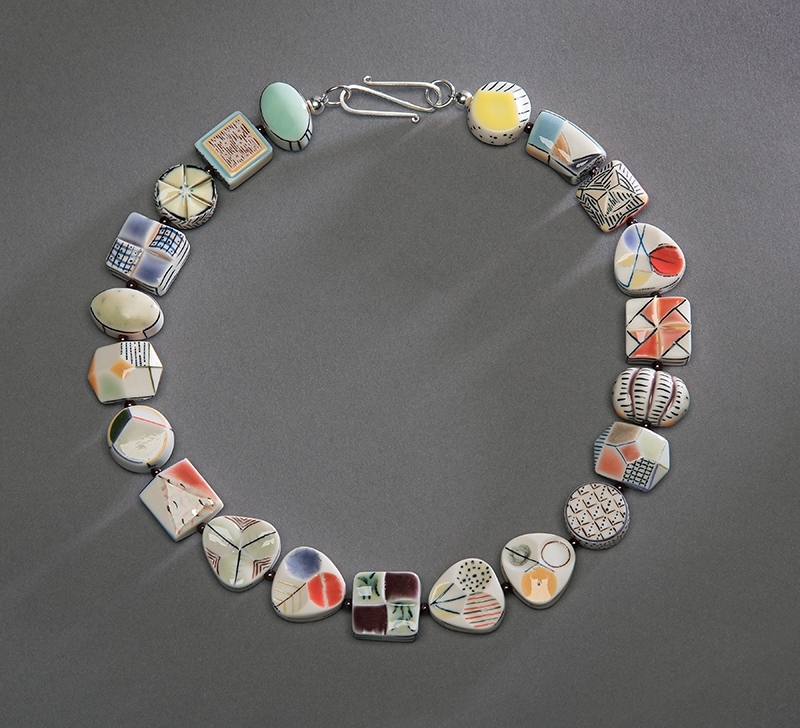 This arrangement increases visual clarity, accents the porcelain beads and helps them to flip 180 degrees. When using a sterling clasp closure, I use one hand forged for me by a Danish silversmith. My necklaces are reversible, designed to change depending on which bead side faces up from the body. Most beads also rotate individually. The wearer can continue enjoying choices that I have initiated. 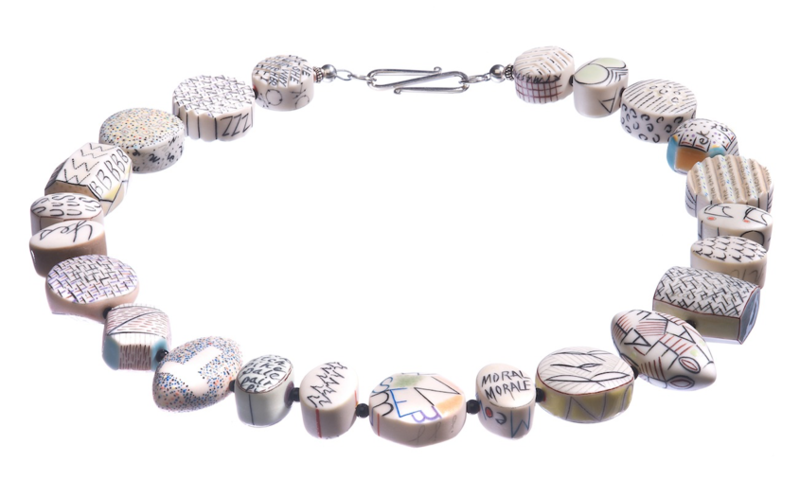 Form, color, graphics, neighboring beads and the wearer of the necklace all contribute to its personality.